Thank you for joining us for the Yamim Nora’im (High Holidays) services. We look forward to a meaningful & inspiring experience, and wish everyone a most wonderful coming year. This year, we will be conducting our services for both Rosh Hashana and Yom Kippur at our synagogue facilities. Below, you will find a seating fee chart, a detailed schedule of services, as well as membership information. We are privileged to have accomplished Hazzan and Torah scholar, Rabbi Moshe Cremisi of Jerusalem as our cantor this year, and are confident that his sweet, inspiring voice will help us have an uplifting and memorable experience. There is going to be a gourmet lunch served on first day of Rosh Hashana, Monday Sept 10 (reservation required), as well as the usual Kiddush-lunch on Shabbat Shuva, Sept 15. 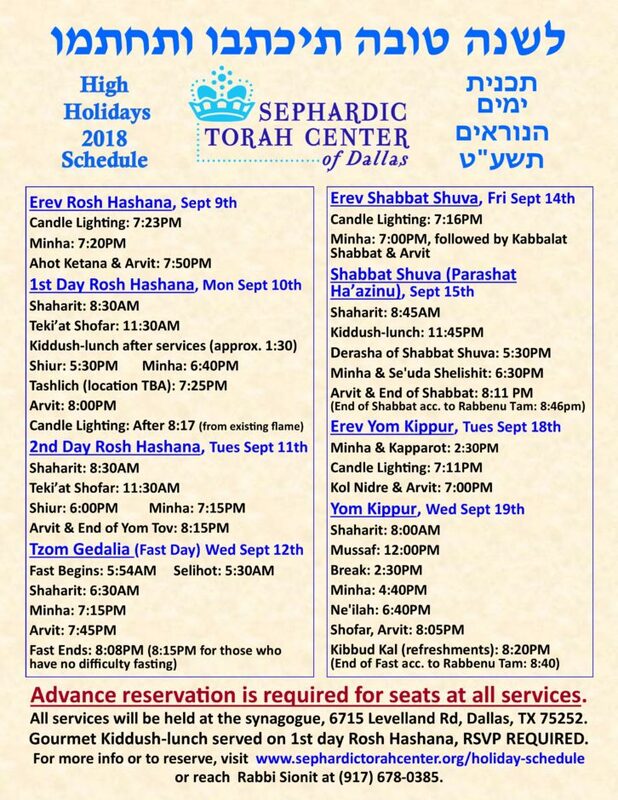 There is no kiddush served, however, on 2nd day of Rosh Hashana. Due to space limitations, advance online reservation is required for attending any of the services. You can reserve your seats by clicking HERE. Your received payment will serve as the confirmation. As always, please be reminded that although the seating fees are important for covering the synagogue’s expenses, they should not deter anyone with financial difficulties from attending our services. Anyone who needs to discuss special financial considerations is asked to speak with Rabbi Sionit. There will be child-care and programs for various ages during the main parts of the services. Please reach Ruckie Sionit at rsionit@gmail.com or (917) 930-7061 to register your children or for more details. Everyone is highly encouraged to obtain synagogue membership. Among other benefits, members are entitled to discounts on High Holidays seats and year-round events. 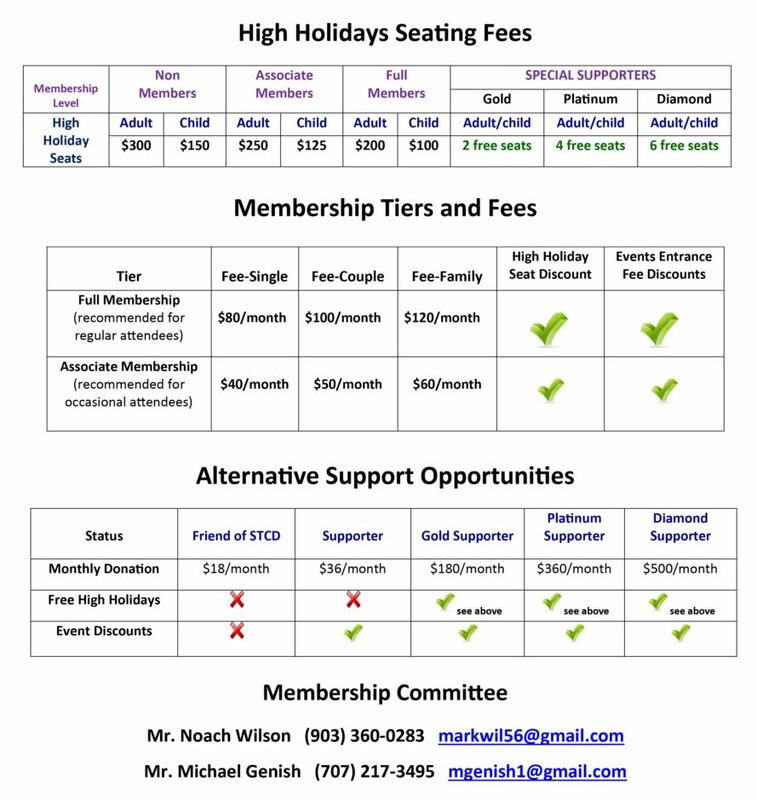 Please note the difference in the seat fees for members, associate members, and non-members in the table below. In addition to the benefits you can gain by becoming members, this is also a significant way you can help the synagogue keep up with its growing ongoing expenses. To take advantage of this opportunity, please click HERE.